Recorded January 26, 1951, at a concert in Vancouver, Canada. 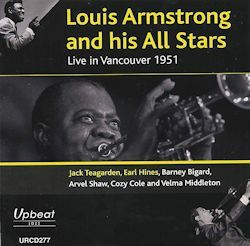 The recording of this concert certainly helps fill a gap in the discography of the Armstrong All Stars since there is a dearth of recordings by this particular All Star lineup, as Bissonnette intimates in his liner notes. Armstrong completists who do not already have it will certainly want to get this CD. Other fans may well have a mixed response to it, as I must confess I did for reasons given later. The quality of the music, with a couple of minor exceptions, is very good overall. Armstrong is at the top of his form, both on trumpet and on vocals, and the audience clearly loved both. I am partial to Armstrong myself, although I don’t care too much for the bravura displays in the extreme upper register that were dear to his heart (and probably played a part a year or two later when he almost shredded his lip). However, his obbligatos behind Middleton’s vocals and his cadenzas such as that on Ain’t Misbehavin’ on this disc are sublime. But he was always generous with the spotlight, allowing it to fall on everyone at one time or another during a concert. Teagarden is given center stage here on Stardust, being accompanied only by judicious chord comping by the ensemble. After a languid rubato introduction, he then proceeds with a passionate rendition of the tune, ending with a fine cadenza leading up to the closing chord. That is followed, unfortunately, by a purely gratuitous drumming coda of sorts by Cole. Barney Bigard has a couple of features in this setting—Tea for Two and C-jam Blues. The first of these is taken at a rapid tempo. The backing indicates some careful scoring, but to my ears Bigard creates a mish-mash of notes from time to time, a demonstration of how many notes can be squeezed into each measure as he runs arpeggios; and his lengthy duet with Cole does not contribute much musically, the coda coming as a welcome relief. The second Bigard feature, C-jam Blues, is taken at a more leisurely tempo after Armstrong’s spoken intro, in which he gives a nod to Ellington. About three-quarters of the way through in the arrangement ofC-jam Blues that follows, there is nice quotation from Ellington’s Rockin’ in Rhythm. But too often there is a seemingly endless repetition of phrases by Bigard, which I did not find congenial. Hines, too, is given the stage to himself on Love Me or Leave Me as he is accompanied only by the rhythm section. While I enjoy Hines’ piano playing, I don’t think it fit well with the Armstrong All Stars, being outside of their particular “traditional jazz” métier. Others, such as Shaw on string bass and Cole on drums, are given extended breaks. And that brings us to the vocals. Those by Armstrong are what by now we are well accustomed to hearing, and they were greeted rapturously by the attendees at this concert, particularly the duet he shared with Teagarden on Old Rockin’ Chair, including their humorous banter back and forth as they traded verses. As this number concludes, the audience is very vocal in their appreciation. Ms. Middleton, on the other hand, is another story. The best I can say of her singing is that it is adequate, but she is no blues singer of the classic mold. She was more renowned, perhaps, for her acrobatics and mugging on stage, which the audience is possibly witnessing, judging by its response during The Hucklebuck and Where Did You Stay Last Night? I only saw Velma Middleton once in a concert by the All Stars I attended in Nashville, ca. 1957 or 1958. She was an extremely large lady—said by one commentator to weigh 250 lbs. and another 300 lbs.—and she only reached about five feet or so in height. She was much given to dancing around on stage, all avoirdupois a-quiver, and ending many songs by going into a split. I confess the display put me off—but not the audience, by and large. They applauded wildly and cheered, spurring her on to greater efforts, as they appear to be doing here. She was undoubtedly a good sport and a very likeable person—Armstrong defended her fiercely when the critics went after her, and she was a member of the group right up to her fatal heart attack while on tour with them in Africa in 1961—but she was a singer of less than bountiful talent. While I regret closing with a cavil, I would be remiss in not considering the sound. No information is given as to the kind of recording equipment used here. It seems to have been rather primitive as there is poor definition of the instruments, the brass “buzzing” frequently; and the balance and separation are often off. The drums do not fare well, having dull, loud tom toms—almost deafening at times—and hissing cymbals throughout; and the piano and bass are often off mike. All in all the audio is of a “lo-fi” caliber. Those for whom sound quality is not crucial will probably have no trouble with it here, but for all others this caveat is given so that there will be no surprise that might be unwelcome. The result of all this is my being conflicted about this CD, as I mentioned above. There is much to like but there are also a few negatives. *On DW 25, all the titles on Riccardi’s list with the exception ofCan Anyone Explain; Big Daddy Blues; High Society; andBugle Blues are included, as is Where Did You Stay Last Night?